Had a nice 40 mile ride through the forest on solid frozen roads and some singletrack. A bit cold but I stopped at a Skicabin for a donut and a change of socks. (the only way to get through more than two hours without my toes going numb). Um, I see no other bikes or signs of humanity in that photo. As beautiful as it is, it seems like you would be one mishap away from a hypothermic death. But no pun intended, it is pretty cool. That settles it; I'm going for a ride. It's in the 20's here and they are calling for snow. Perhaps I'll take my camera. Had to do a few MTB rides this winter due to Ice and Snow and I wasn't so lucky. The roads- where not covered in Ice- had wet slushy ruts from the car tyres and once offroad there was nothing done to the trails. But Feet were not a problem till we had had our fun and it was just the hard slog back through the Slush. 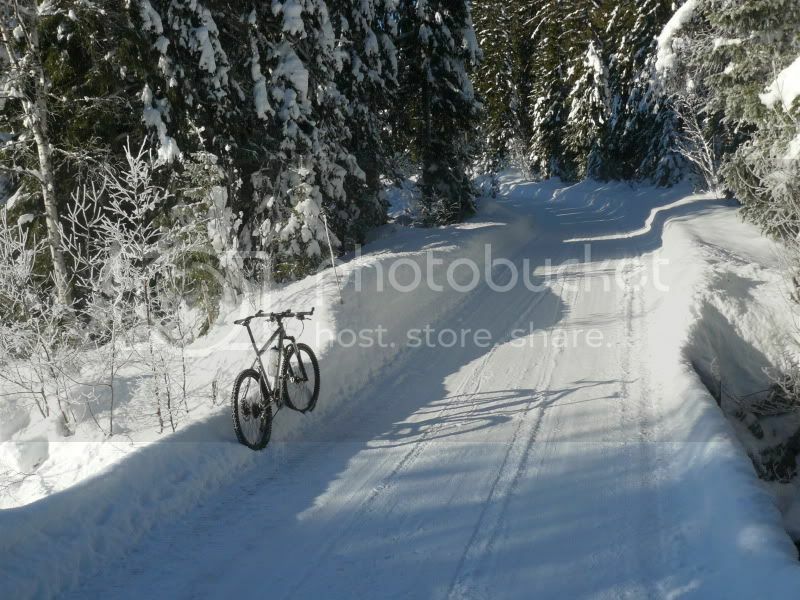 Looks as though your ride was more enjoyable than ours - we had to do a bit of carrying to get through the snow drifts. So pretty and remote -- I've never ridden in snow like that but it looks very doable. Glad you had a place to keep your feet from freezing; that's usually my weak spot. Numb feet do not a fun ride make. Thanks for sharing, and ride lots! Snow drifts in the South east of England ! Took some resolve and guts to get through your ride. Last edited by plodderslusk; 02-14-10 at 03:00 AM. This is up on the South Downs- The bare open hills that will get any weather going- but the pics are a cheat. We did plan to ride the 5 or 6 miles over the top of the Downs on the South Downs Way. But for some reason did not manage it. Got to the Downs but they were unridable. Instead we did a bit of valley trail riding but the trails are in the last two pics of the Gateway and Robin Post. We tried to stay off the roads as they were slushy and icy as in the first pic. But I have lived here for 23 years now. Had snow 5 years ago and this year- but everywhere has had snow this year. Other years and it has just been a sprinkling if any.